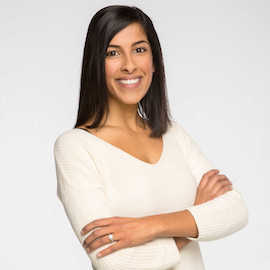 Sameera Banduk (’09) is a marketing professional with a passion for the tech industry. As the marketing director for Thalmic Labs, Sameera focuses on increasing awareness for Thalmic and the Myo armband. She believes the company is going to revolutionize the way we interact with technology. Alma Matters recently sat down with Sameera to catch up. A: After graduating from Laurier, I immediately started working at Well.ca on a 3-month internship. I came across the role on the Laurier career boards and was planning to complete the internship while looking for a full-time position. Well.ca was experiencing rapid growth at the time and I was able to grow with the company, first as a marketing specialist and later as the marketing manager. After spending nearly four years at Well.ca, I moved back to my hometown of Waterloo and joined one of the hottest tech companies in the region, Thalmic Labs, as the 12th employee. I've been at Thalmic since March 2013 and it has been an incredible ride. Q: What was the most memorable part of your BBA experience? A: I absolutely loved the size of the classes from 2nd to 4th year – they allowed me to get to know both students and professors who are as passionate about marketing as I am. Some of my best friends today are people who I met in the BBA program and I often message them in our WhatsApp group when I'm in need of advice. As I still live in Waterloo Region, I've also been able to return to the school a number of times to give guest lectures to prospective BBA grads. Q: How has your BBA helped you in your career? A: While the academic curriculum that I completed during my time at Laurier is something I'm truly proud of, it's the group work and relationship building that has made the most meaningful impact on my career thus far. My strengths of being comfortable presenting, managing people and projects, and articulating my thoughts have all stemmed from my time at Laurier. On the academic side, beyond marketing, Laurier allowed me to master data crunching in Excel, which is crucial in today's marketing world. Q: What's next on the horizon? A: I was born and raised in Waterloo Region, and I'd love to continue to live my life here. There are so many exciting things happening with the tech companies in the region and I think the demand for Laurier BBAs is going to soar as these engineering-focused companies continue to grow. As for Thalmic, I truly believe that my brilliant colleagues have the chance to shape the next transformational shift in the way we interact with technology, and I'm thrilled to remain on a team committed to building the future of human-computer interaction.